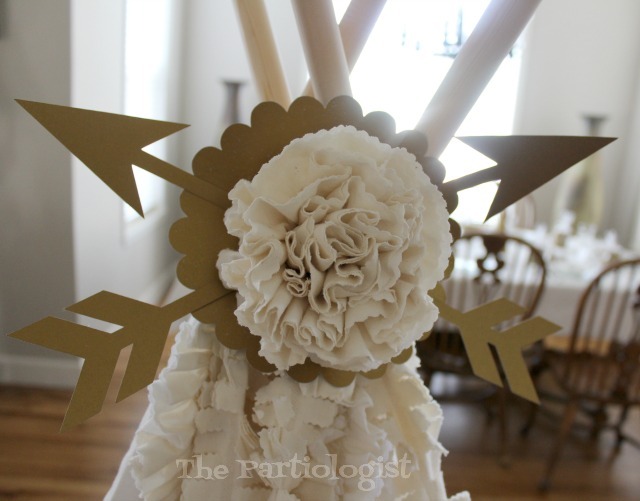 The Partiologist: Bohemian Themed Dining Table! On rare occasion, I have enough room at the table for each guest to be seated. This was one of those times. Now that you've seen the Desserts placed under the Teepee, I'm excited to show you the table decorated for the Bride Tribe. First of all, you won't believe...well maybe you will, how I created this table top. Don't you love the look? 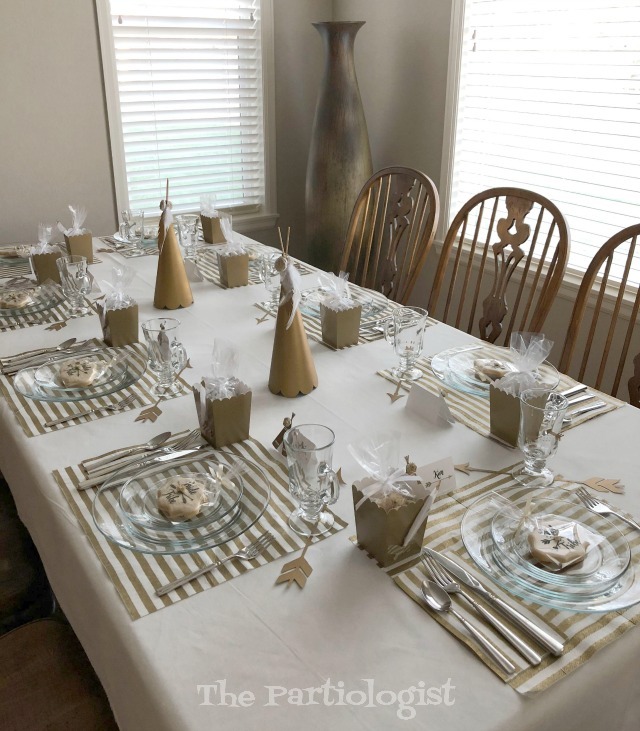 After I purchased the Teepee, I matched it to fabric I could use for the tablecloth. 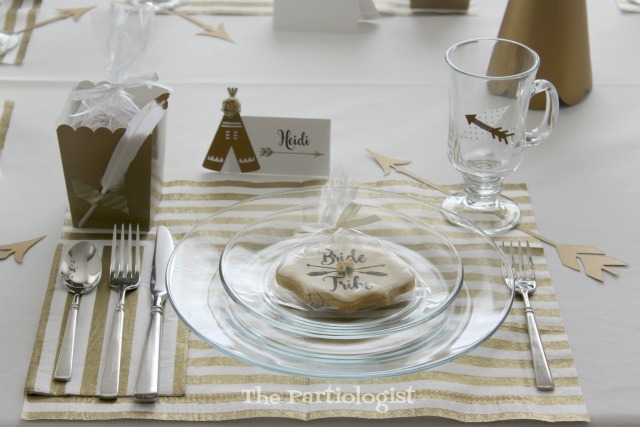 Each placemat and napkin, topped with clear plates, cookies and more. Such as the place card I made with my circuit. 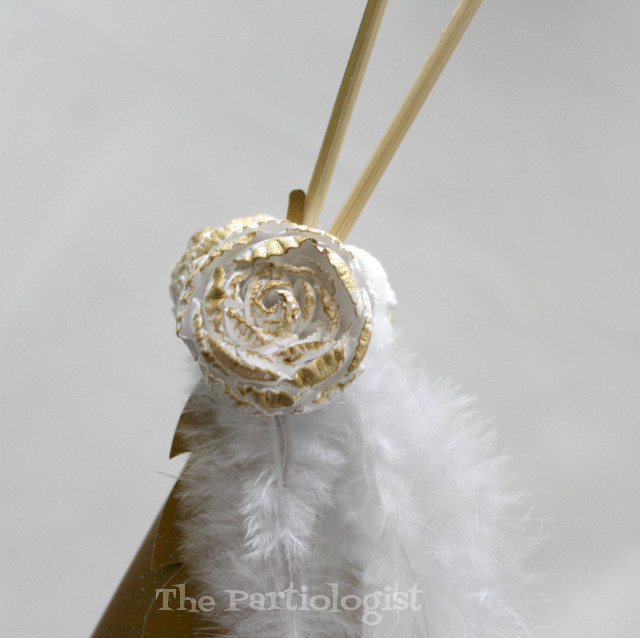 After cutting out the teepee, I hand painted a paper flower and glued on the top. I had just enough room for everyone! 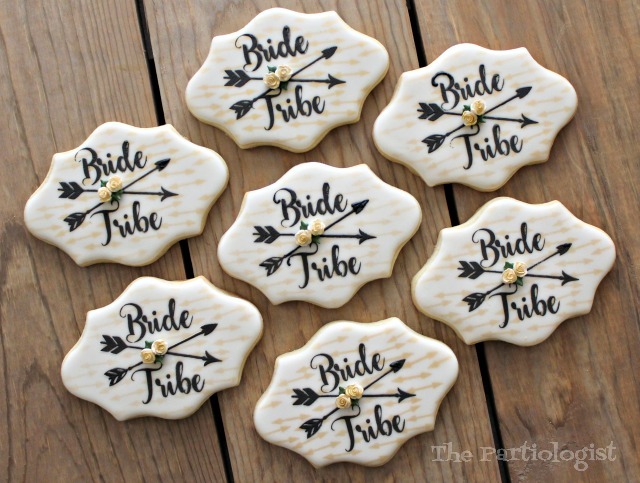 And of course I made extra special cookies for each of the Bride Tribe. Good vibes for the Tribe! On the corner of each place mat, I cut arrows to place under the glass cup. 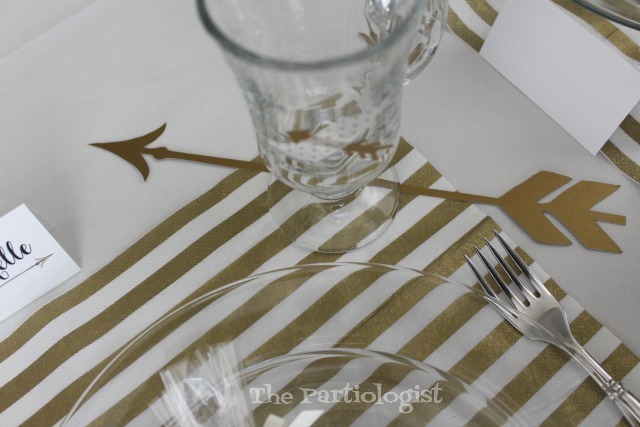 And each glass cup had an arrow attached with gold polka dot washi tape. 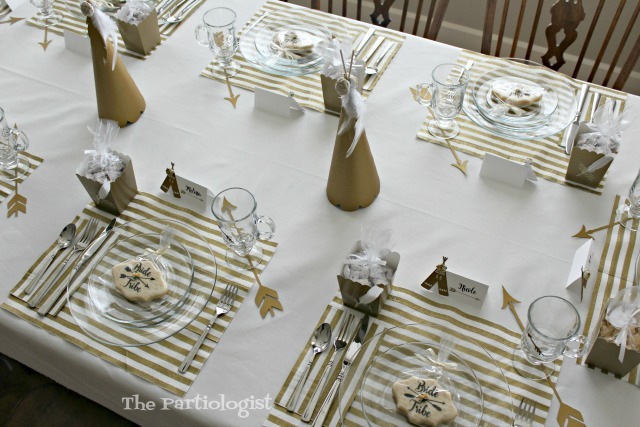 I set my table and worked on the Teepee a week before the party. 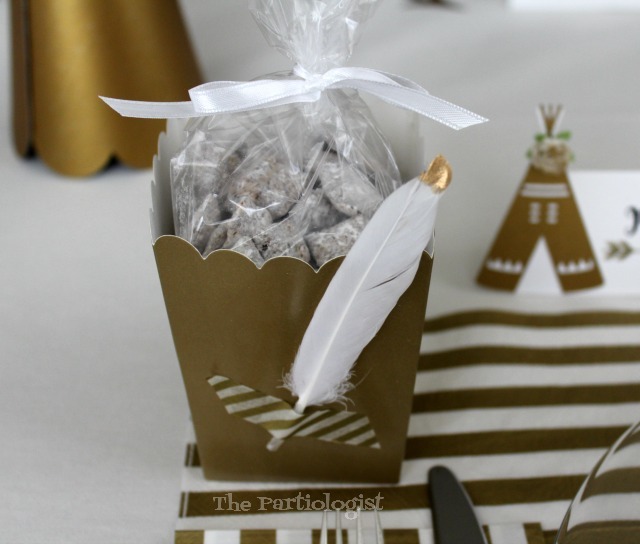 Then filled matching gold boxes with homemade Muddy Buddies. 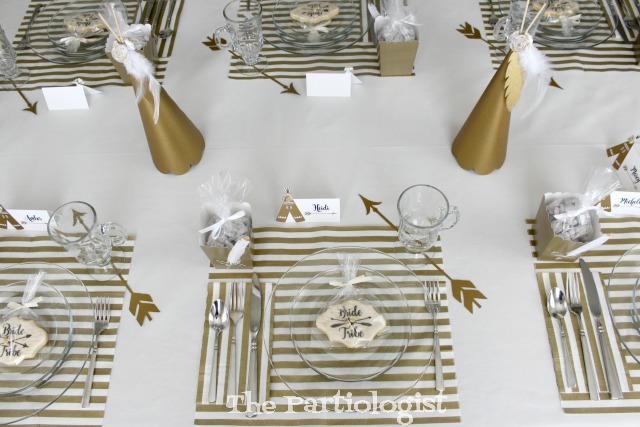 Each box was decorated with a gold tipped arrow attached with gold striped washi tape. 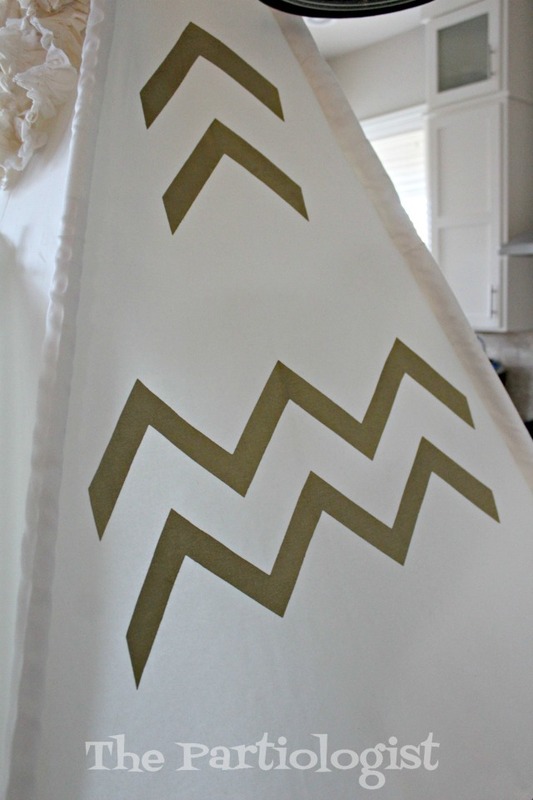 Once I found the teepee decorated with gold and cream, those were the colors for everything. 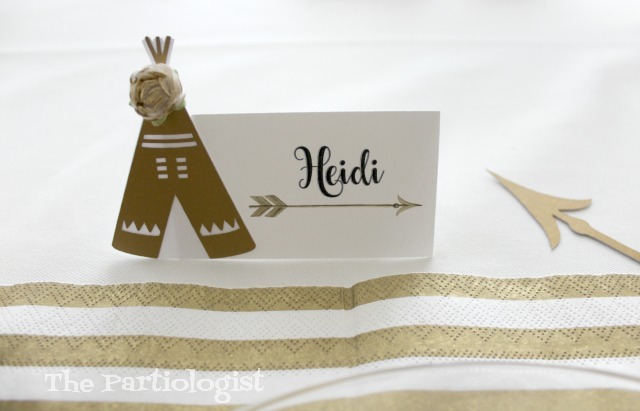 This little teepee was made with my cricut and I added hand painted paper flowers and feathers. Have you figured out what I used for the placemat? This is where I had to get creative. My plan was to use my gold chargers under the glass plates. But then I got them out and YIKES! Do you even know how many shades of gold there are? Well, my gold chargers are beautiful, however they did NOT come remotely close to the color of the gold on the teepee. 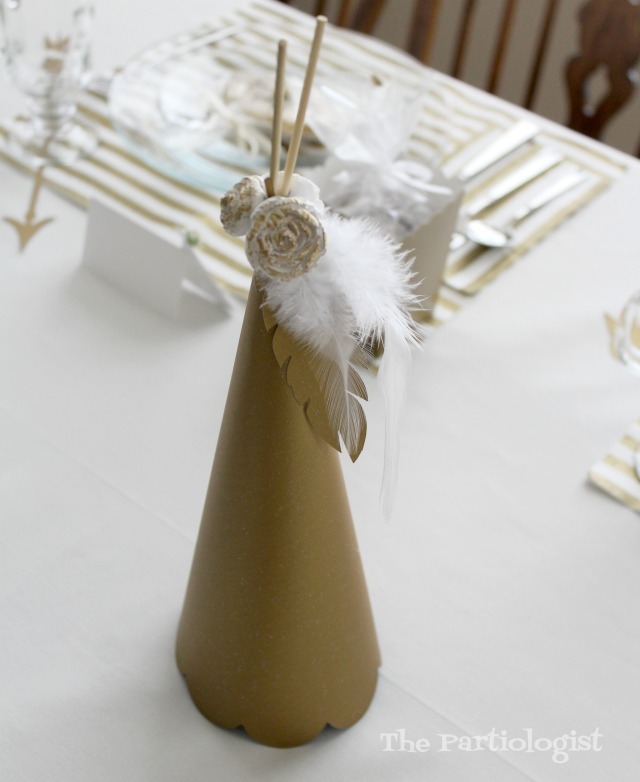 And if you know me, there was no way I was going to use the wrong color gold on the table. I was looking at the napkin and all of a sudden it hit me....the napkin! 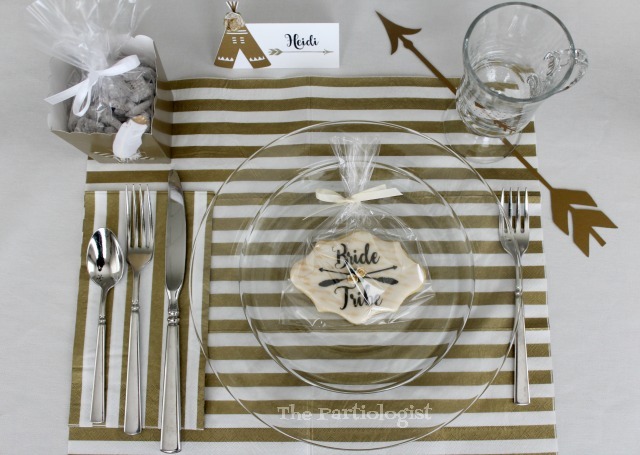 I opened the napkin and ironed it with a warm iron to make the placemats! 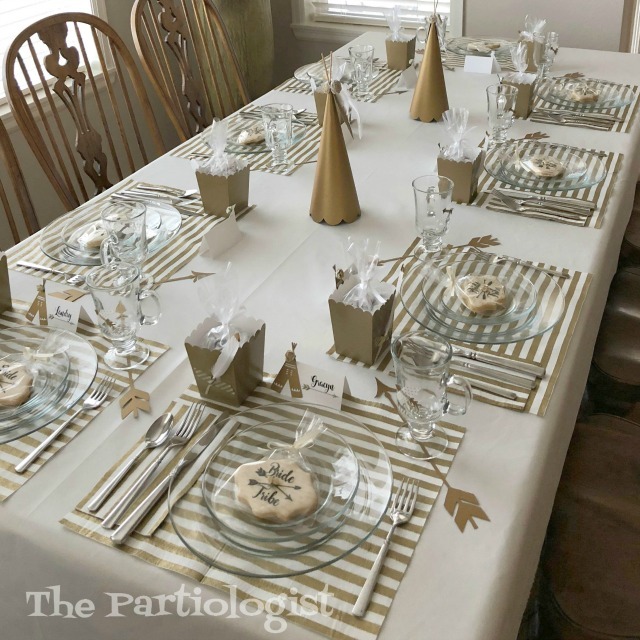 Now I had matching placemats and napkins! One of my favorite tables for sure! During the luncheon, I had tribal music playing. I found a beautiful relaxing CD on Amazon, I think I could listen to it all day. Please be seated, lunch will be served! Your table looks amazing! The cookies look really fabulous and I know they taste great too!!! 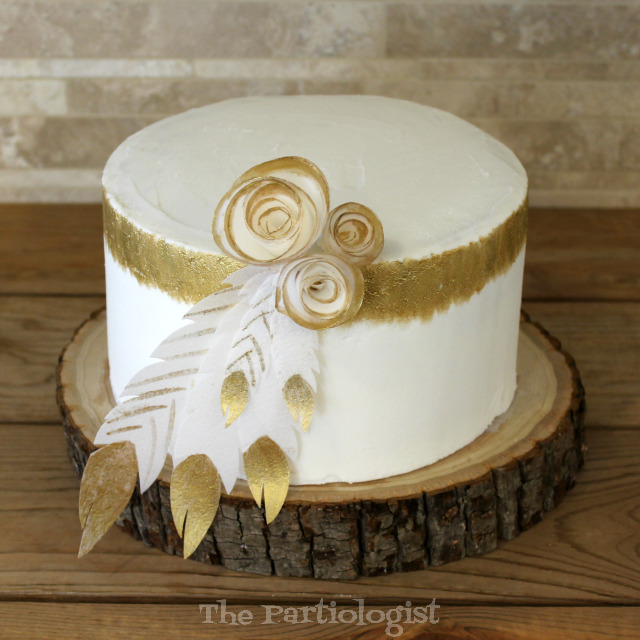 Thank you, I was so pleased with how it turned out! 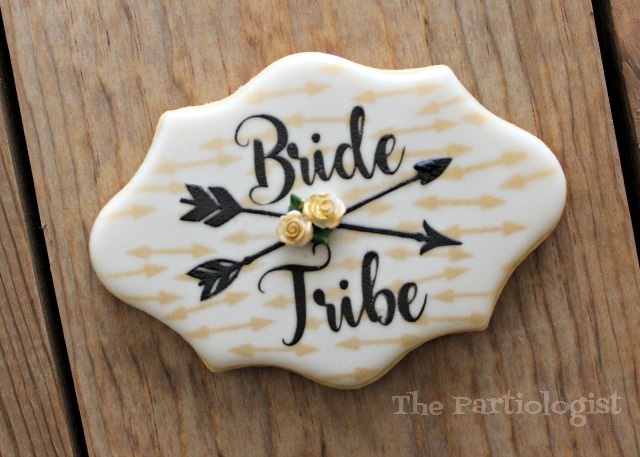 I love this simple beautiful design...not simple to make everything I'm sure, but it is so wonderful!!! What a wonderful Idea(s)!!!! It was just what I was hoping for, after many hours of styling! Thank you!